Home > Law Books > Practice Materials > Structure of M&A Contracts, 2016 ed. Structure of M&A Contracts, 2016 ed. 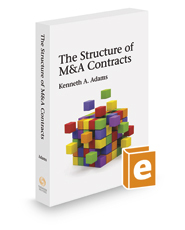 Structure of M&A Contracts offers a detailed and practical account of the function of the different categories of provisions in a mergers-and-acquisitions contract and the interplay among them. These are important topics and a slight change of phrasing in one part of a contract can have important implications for other parts of the contract. And issues relating to contract structure arise routinely in M&A negotiations. The author applies to this subject the innovative approach he has brought to bear in his writings on contract drafting. He specifies what wording you should use in a given context and what you should avoid. And some analysis is presented in a series of figures, so as to make it easier to understand. This book is a valuable resource to anyone involved in M&A transactions.